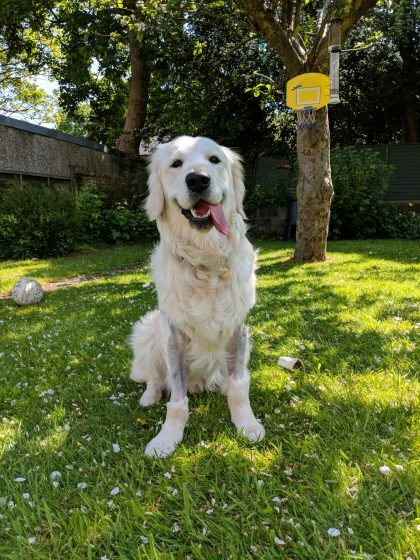 Before we got Woody, we researched into Golden Retrievers and knew that dysplasia was quite common within the breed (well within any large breed of dogs actually) but never did we think we would receive the devastating news when Woods was just 8 months old. I wanted to share our story for many reasons: to keep a diary on Woody – when he has flare ups and when he doesn’t, to look back on whenever we do have the bad days to remind us just how far we have come and also in case you reading this are going through it – I want you to know that you too will be ok. 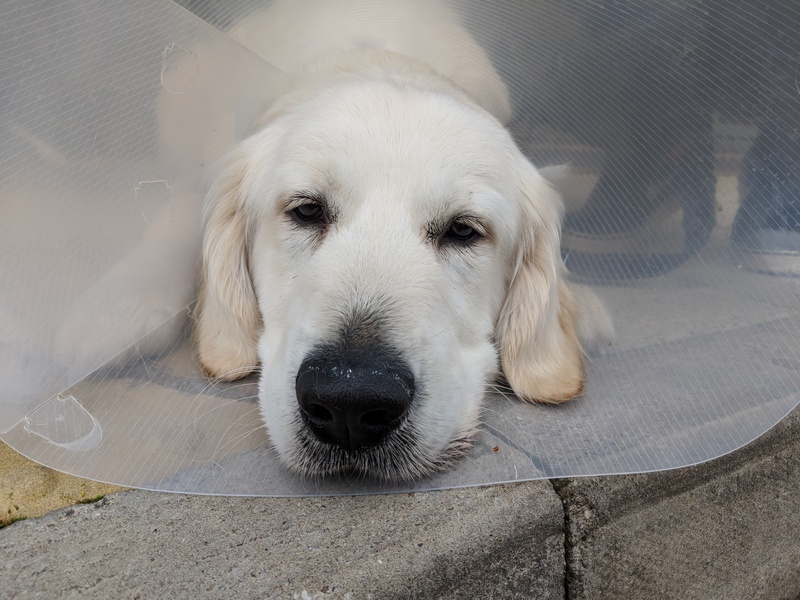 I bet you’re wondering how we found out about Woody’s elbow dysplasia? Well, I guess you could call it ‘mother’s intuition’. One evening after a nap, Woody had a slight limp. He wasn’t yelping and was still his normal playful puppy self. We examined his paw pads thinking that he could have had something stuck in there but nothing. We felt all of his limbs and he didn’t flinch or yelp, he just lay there and let us do it (what a superstar!) The only way to describe it was as though he had lay funny and had a bit of a dead leg. When we woke up the next morning, he still had a slight limp. Something didn’t sit right with me so I made the call and got him into our vets that very morning. Straight away when we walked into the room our vet saw his slight limp and upon her examination, she wasn’t happy and thought that his right elbow didn’t flex as much as it should or as much as his left one did. To determine for sure what this could be, she recommended having an X-ray so that we could get a deeper understanding of if there was anything wrong with the joint. Woody had his X-ray three days later and the results we got from that was the start of the news that we really didn’t want to hear. We got told that his bones weren’t as straight as they should be. This paired with his lameness we had experienced and the joint not flexing as much as it should all pointed to it being elbow dysplasia. How? At only 8 months old? We couldn’t understand it and hoped and prayed that it still could have been a little blip and that he would back to ‘normal’ in no time. Following on from our X-ray results, we got referred to an orthopaedic specialist, Willows Veterinary Centre & Referral Service who we managed to see us the week later. Woody had a thorough examination (and of course he was a little superstar again) and the specialist also believed that it was dysplasia when looking over the X-rays we had done at our local vets but couldn’t 100% confirm just on an X-ray alone. Woody needed to have a CT scan to be sure (how much more poking and prodding does our pup have to go through?! is all I could think). We made the decision to leave Woody there that day rather than coming back on a different day and prolonging the process (and diagnosis). At this point, we wanted to know what we were dealing with. The unknown is a horrible place to be in. Four hours later, we returned to get the results. If miracles existed, now would have been the time to prove to me that they did because I hoped so hard this was all one big mistake. Our specialist broke the news that had been looming over us from our first vet visit one week earlier. Unfortunately, Woody does have elbow dysplasia. Don’t cry Liv, don’t cry! Keep it in and listen to what he has to say. He continued to tell us that he has early onset of osteoarthritis and that will get worse with age. The specialist was becoming blurry behind the tears filling up in my eyes and I couldn’t help but burst into tears at the news – damn you emotions! We were told that this was something Woody was born with – which as much as it may sound odd, was reassuring because we felt as though this some how was our fault – what did we/didn’t we do?! We know we were really strict and didn’t overexercise and always stuck to the 5 minute rule (I told you we researched). Because we found this so early, we had an option to have surgery. This was to remove fragments of bones within his elbows which would give him short-mid term comfort. These bone fragments are part of the dysplasia and often get compared to for us humans as having a stone in our shoe – we all know how irritating that is. We were told that as for his osteoarthritis, that will be something that will worsen with age. However, medication or different therapy is available when we need it and the idea of having a joint replacement in later life is also an option (the things we can do these days is incredible). We left Willows devastated and in shock. Although we got told over a week before his appointment there that it could be dysplasia, we stayed as positive as possible and hoped so hard it wasn’t it so it felt like we were receiving that news all over again. We thought about whether to go ahead with the surgery or not for a week after our specialist appointment. We weren’t under the illusion that Woody would be fixed after it, we knew that the surgery wasn’t going to cure him. I took to Instagram, Facebook and forums for advice and support on what we should do. I was blown away with all of the messages we received, from friends and family but also strangers who we don’t even know. Every single message we received meant the world to me. I was in unknown territory and it was a super scary place. It helped knowing we weren’t alone. One week later and we had a date booked for the surgery. We were prepared to do whatever it took to give Woody any comfort he needed and we knew this operation would help him albeit short term. The surgery went really well, Woody had to stay overnight (that bit was hard) but he received the best care possible! We went to collect Woody the following day and the specialist told us about the non-invasive keyhole surgery he carried out the day before. The good news is that Woody’s left elbow is a lot better than his right and the specialist was hopeful the surgery will help him long term. His right elbow is as bad as we thought and will give him the problems throughout his life. But we will take that good news about his left elbow – every cloud and all that! We couldn’t wait to see our boy and after a VERY long 24 hours we were reunited. 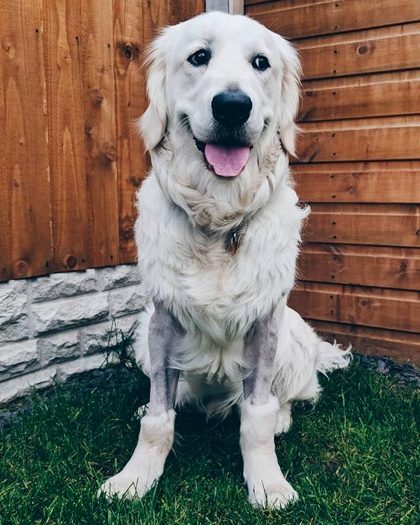 Woody rocked a new look – shaved legs and the cone of shame but he was still his excitable HAPPY self. Before you get a dog, you have a preconceived idea of what life will be like together. We had that too. We were going to be hiking buddies, climb Snowdon and just enjoy the great outdoors together. We thought this wouldn’t be possible after getting Woody’s diagnosis but the best advice our specialist gave to us was ‘make Woody an athlete’. And that’s our current mission! No he won’t be able to climb mountains every single day and he may tire quicker than other dogs but he will lead a normal life (well as normal as possible with us two weirdos – sorry Woods). Woody will have his limits and we just have to learn what they are and work to them. We know we will have good days and bad, but if the crazy month we have had has taught me anything it is that happiness is letting go of what you think your life is supposed to look like and celebrating it for everything that it is.